Nokia on its way to introduce its new Nokia C7 Smartphone in markets soon.Its expected that the new Nokia C7 Smartphone will be available for a price tag of €335 by Q4 2010. 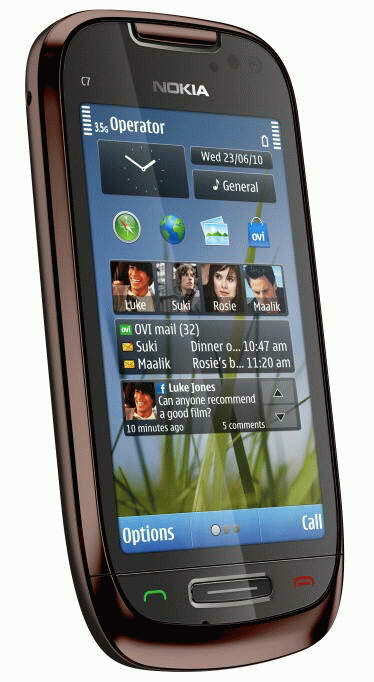 The all new Nokia C7 Smartphone runs on Symbian 3 Os and a stylish look which is made of stainless steel.Nokia C7 Smartphone will be available in silver, brown and black shades. New Nokia C7 smartphone comes equipped with a 3.5-inch capacitive touchscreen AMOLED display with resolution of 640 x 360 pixels and houses an 8 megapixel autofocus camera with dual LED flash provides record 720p HD video at 25 fps.The smartphone includes a 390MB RAM, an internal memory of 8GB and a microSD/microSDHC memory card slot support up to 32GB card. 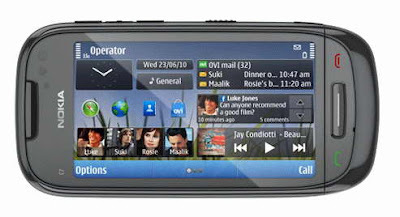 Nokia C7 smartphone Features includes Wi- Fi 802.11b/g/n, Bluetooth 3.0, GPS, 3.5mm headphone jack, TV-out, radio, FM transmitter and MicroUSB connector that supports USB-On-The-Go.The smartphone is designed to support GSM/GPRS/EDGE 850/900/1800/1900 MHz and UMTS/HSDPA 850/9/1700/1900/2100 MHz networks. Tags:-Nokia C7 Smartphone price, Nokia C7 Smartphone launch, Nokia C7 Smartphone features, Nokia C7 Smartphone price details, Nokia C7 Smartphone specifications, Nokia C7 Smartphone images, Nokia C7 Smartphone availability, Nokia C7 Smartphone release, Nokia C7 Smartphone india launch, Nokia C7 Smartphone camera, Nokia C7 Smartphone memory.